Today on homify we’re going to take you inside a truly gorgeous timber home. Highlighting wood beautifully inside and out, this abode offers a spacious interior, grand façade and plenty of classic charm. Whether you’re planning a domestic renovation, a refresh or a completely new build, we’re sure you’ll enjoy checking out this incredible home. We start today's tour at the rear of the house, checking out the impressive exterior deck and wonderful entertaining space. The garden is beautifully maintained, with impressive garden beds, flowers and potted shrubs. This image also gives us a great indication of the style and design aesthetics. 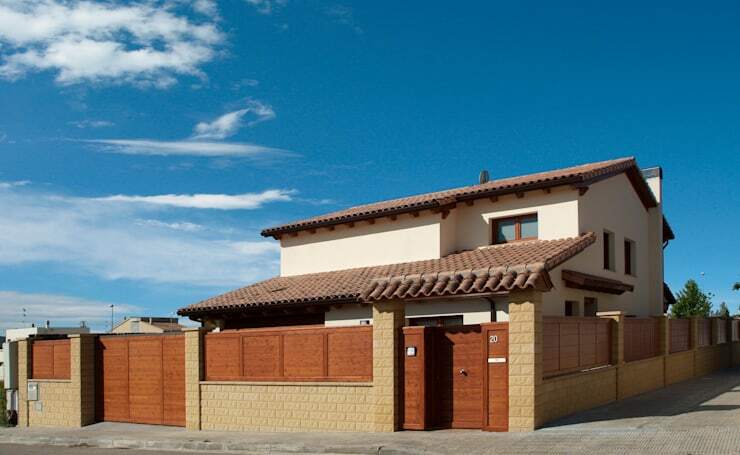 The tiled roof is Mediterranean, while the cream stucco enhances the timber elements and features. Zooming in on the outdoor terrace shows us exactly how large and spacious the area is. Warm stone tiles coordinate with the foundation and evoke a sense of sturdiness and rigidity. 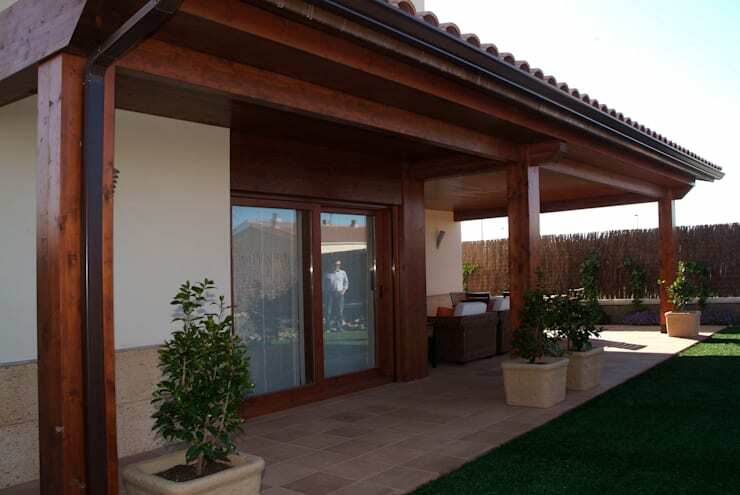 Additionally, the large timber columns are able to be seen in more detail, and frame the large glazed sliding doors. 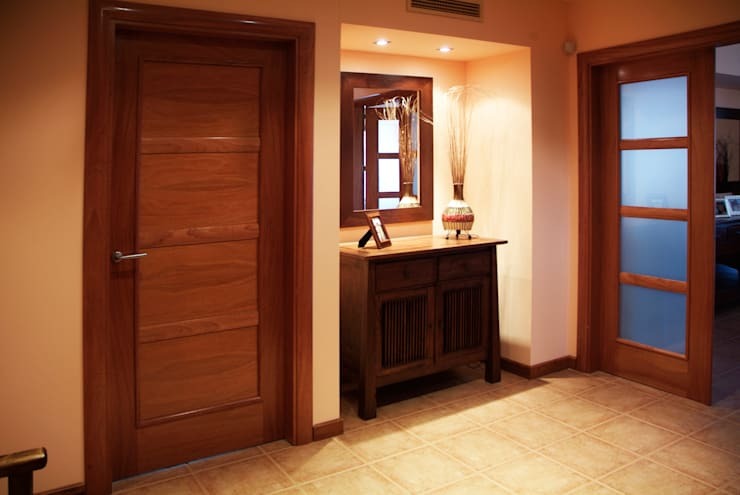 As we enter the house we see that the timber tones are continued throughout. Warm, welcoming and seriously chic, this rustic entry offers its occupants a room they can be proud of. Small details such as the wall mirror and recessed lights offer a sense of practicality, and makes the most of the large yet usable corridor and hall. 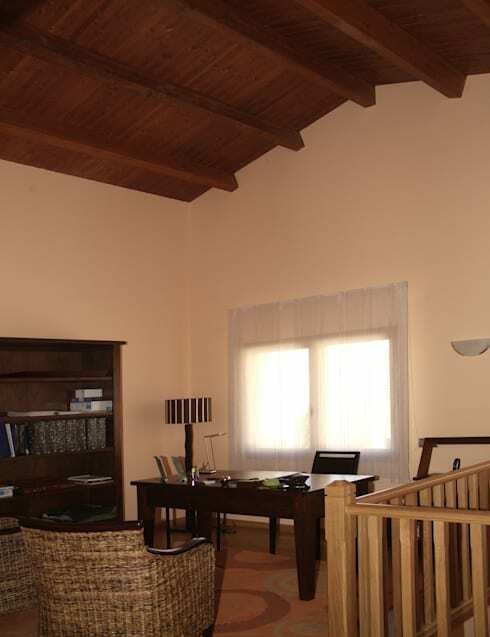 The vaulted ceilings are a truly incredible feature of this spectacular abode. By installing vaulted timber ceilings the room feels far larger than it actually is. Despite common sentiments that a dark ceiling can create a closed-in feeling, this rich mahogany hue actually has highly desirable opposite effect in evoking depth. 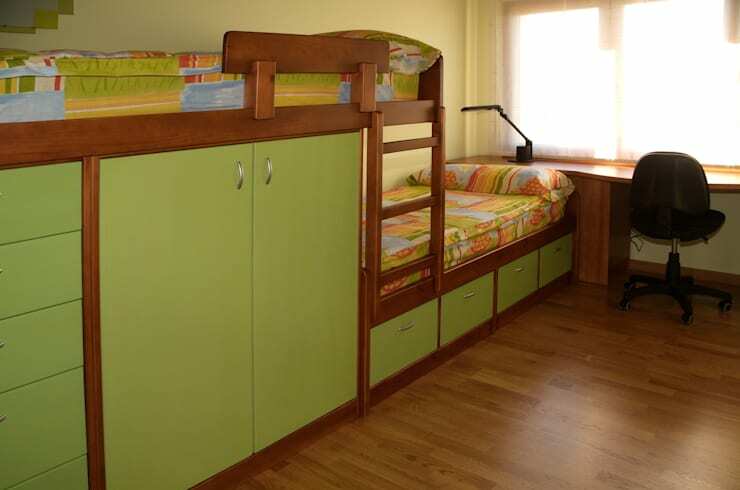 The kids' are going to love their new bedroom, with plenty of space for guest to bunk on one of the two beds. Colourful and playful, the bespoke furniture sits in the corner of the room and provides storage for clothing and accessories. Moreover, the designers have included a handy workspace that is ideal for children or teens to do their homework, play or simply relax. 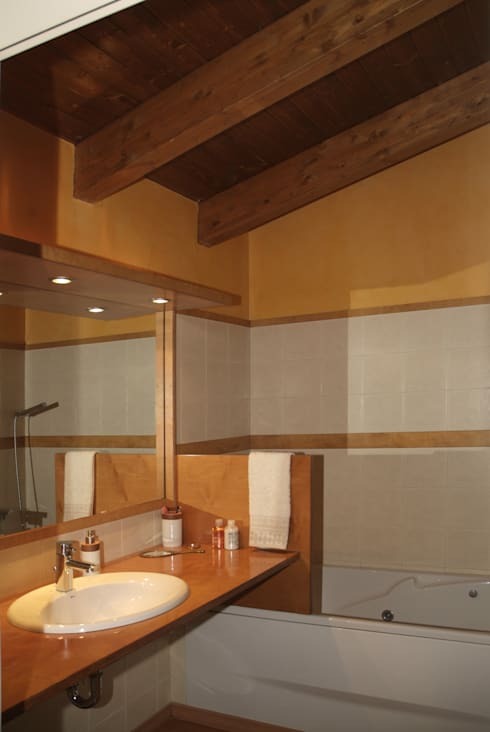 In the chalet-esque bathroom we see the vaulted ceiling once again. Paired with the timber vanity and privacy divider, this room is elegantly refined, yet rustic and timeless. 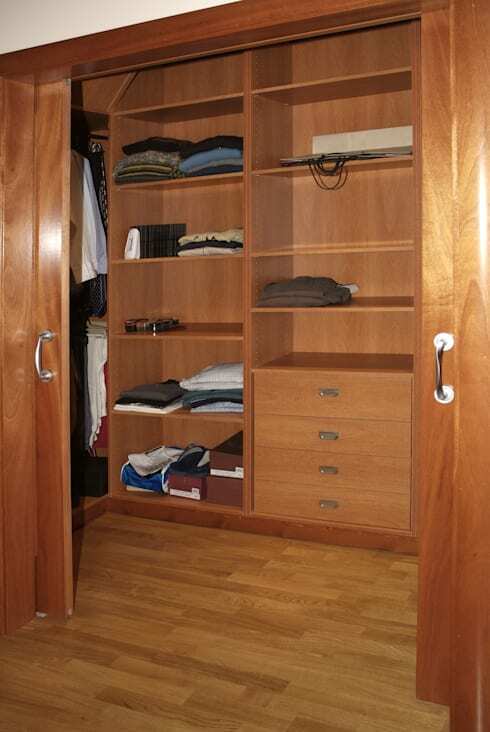 Along with the myriad features, accessories and fixtures within this house, one of the greatest is the extensive walk-in closet. Once again the main material is timber, exuding warmth and a welciming ambience within the bedroom. Before we end the tour we're heading outside to take a final look at the house streetside. Private and secure, the house is modest and humble, yet impressively large behind the timber fence. Did you like the way this home highlighted timber? Let us know below!